Attached is a Regional Order No. 157, s. 2019 from Francis Cesar B. Bringas, CESO V, Regional Director, DepEd CARAGA dated April 03, 2019, entitled “Clarification of the Requirement of Teacher’s Clearance at the End of School Year,” which is self-explanatory, for the information, guidance, and compliance of all concerned. This is to clarify the policy of requiring all public school teachers to secure clearance from money and property accountabilities after every end of school year in view of varying practices occurring in the field. Anent to all existing issuances, orders, memoranda and policies issued by the Department of Education, including all existing rules and regulations, there was no specific policy or directive requiring all public school teachers to secure clearance from government money and property accountabilities at the end of the school year, unless otherwise such concerned school personnel will retire, resign from the government service, and also in case they are transferred or reassigned to another school, government office or promoted to higher office per DepED Order No. 17, s. 2005. All outgoing officials and employees prior to effective date of their transfer, resignation, retirement or separation from the government service must secure clearance of cash and property accountabilities, per DepEd Order No. 23, s. 1993. All Classroom teachers whose pupils/students have lost their borrowed books or failed to return the same, existing DepED Order No. 25, s. 2003 entitled “Resolving Losses of Textbooks”, provides the appropriate remedies and requisites of all concerned teachers to submit an application for relief or accountability or losses. Strict adherence to the requirements and procedures prescribed by the said guidelines should be followed. It is directed that close coordination shall be made with the concerned school head to the school property custodian. In view of above mentioned concerns and considering that the public school teachers are only on vacation during summer, this Regional Office hereby directs that NONE REQUIREMENT FOR CLEARANCE shall be imposed upon all public elementary and secondary school teachers who do not fall either of the circumstances stipulated under DepED Order No. 17, s. 2005 and DepED Order No. 23, s. 1993, effective immediately. It is understood that this directive does not exempt the teachers from the obligations of accomplishing and submitting all required reports especially on the final grades of the pupils and students. School Heads are given broad discretion to issue an office memorandum containing the list of all valid reports and documents that are to be accomplished by the concerned teachers. 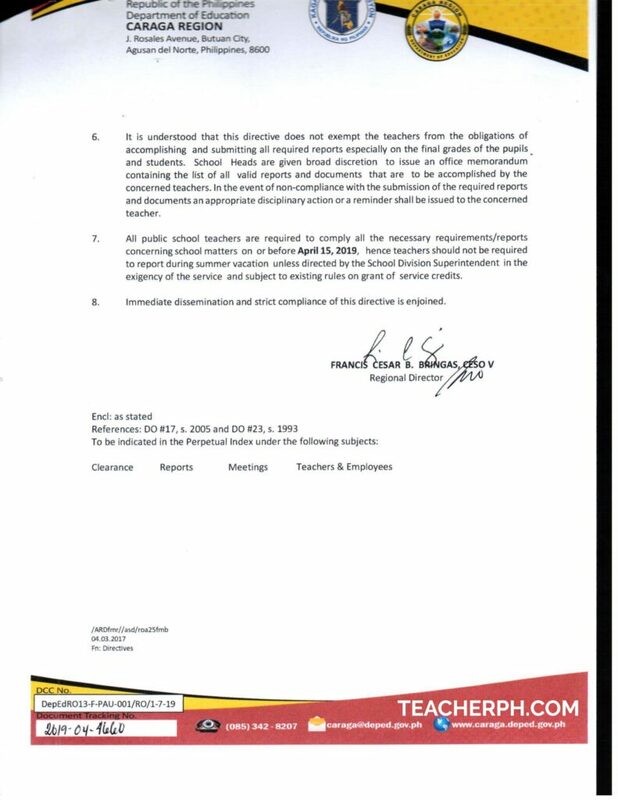 In the event of non-compliance with the submission of the required reports and documents an appropriate disciplinary action or a reminder shall be issued to the concerned teacher. 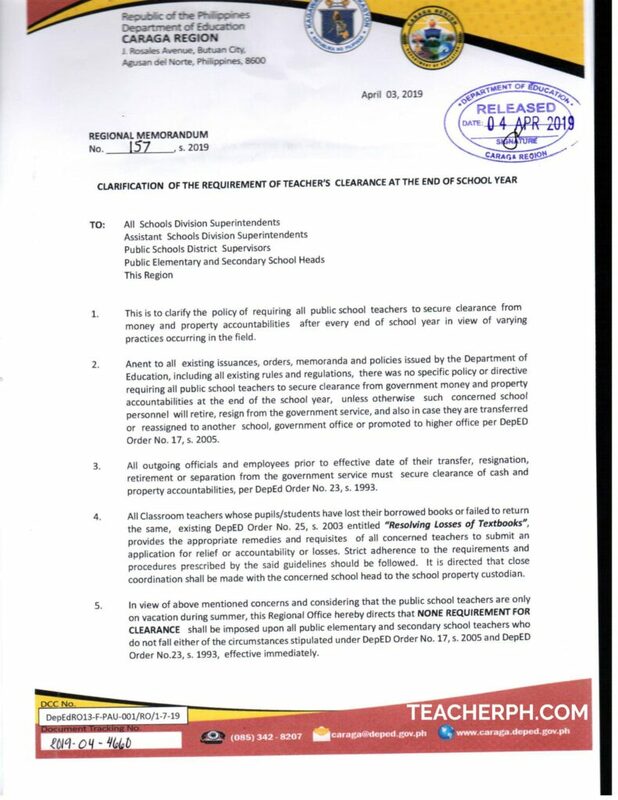 All public school teachers are required to comply all the necessary requirements/reports concerning school matters on or before April 15,2019, hence teachers should not be required to report during summer vacation unless directed by the School Division Superintendent in the exigency of the service and subject to existing rules on grant of service credits. Previous Post: « What Happens When a School Head is on a Power Trip?